Only 6 months after posting her tweet going viral, and Anicca Harriot is already traveling around the country. Her tweet went viral and she gained 1,200 followers practically overnight. She’s worked for NASA, traveled from coast to coast to attend science and tech conferences, visited the White House, and talks to students across America about pursuing studies in STEM (science, technology, engineering, and math). She’s been featured in pieces by Buzzfeed, BET, Huffington Post, and The New Yorker, to name a few. Anicca Harriot is an inspiring and committed Regent student, far from average. She’s set an example of how a Christian leader can effectively engage and interact with culture in a relevant, yet completely original way. In Sept. 2016, Anicca launched into the bright stage lights of social media after tweeting a picture of how she “calculated the angle” of her dab. We had the privilege of siting down and interview her about the popularity and influence she experienced then. You can check that interview out here if you haven’t gotten the chance to yet. Now, seven months after the legendary tweet, I caught up with her again to chat about some of the amazing opportunities this Regent student has had opened to her. 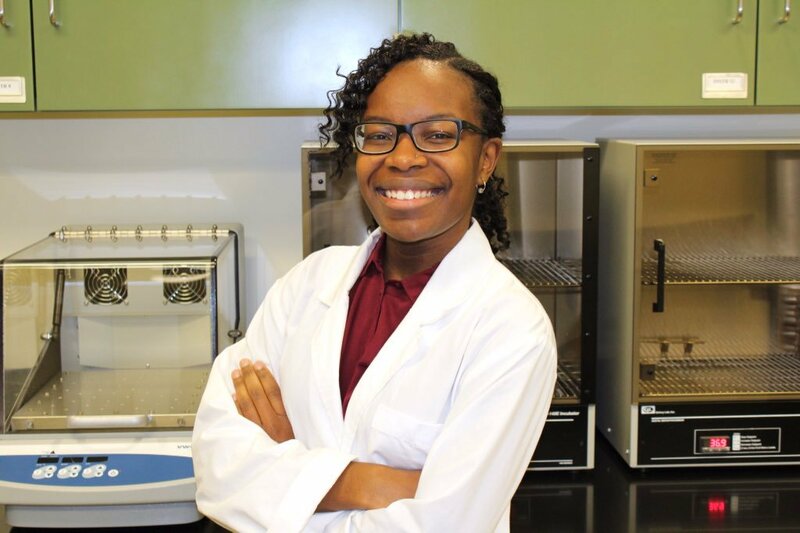 As of now, Anicca plans to pursue a PhD in Biochemistry and Molecular Biology at the University of Maryland after she graduates from Regent. Q: What opportunities have opened up since your post of you dabbing went viral? A: I was able to write for a website called Vanguard Stem. That is run by Dr. Jedidah Isler. She was the first African-American woman to get a Ph.D. [in] Astrophysics from Yale… She asked me to [discuss] what it was like to go viral, for her site. I was able to go to the prescreening of “Hidden Figures” (2017) and that was with her. Everything was paid for by her and Vanguard Stem. Yeah, that was really awesome and it was the same day as the actual premier. The premier was 2 miles away from where I was and it was a really great experience to go do that. I knew Dr. Isler before and she knew of me too, but that was the first time I was able to meet her. Q: You have a really big platform on social media now. How are you able to utilize that? Q: I know you mentioned something about going to San Francisco, CA. or doing some conferences. A: I was also able to do some conferences. I am looking to do South by Southwest and a bunch of other conferences for women in the STEM [as well]. People have asked me to speak at their schools too. Last week I talked to some five-year-olds in Michigan. I was in the lab and skyped in with them and their teacher wanted to know what I would be researching in grad school – which is how space travel affects the human body. She had been teaching them about the international space station. They asked me a ton of questions on that. ‘What is would be like to live on the moon’, ‘can we live on Jupiter’ and things like that. The week of spring break I… [spoke] to some girls in a STEM club in Flint, Michigan. Q: How does that make you feel as a Regent student? You had this one tweet go viral and now you are talking to young girls about STEM and you are encouraging and inspiring other people. A: It’s really weird. I don’t know how to describe it. Even people at Regent will tell me that they look up to me. That is crazy… I don’t feel like I am doing anything that I feel is special. I just do the things I’m passionate about. Other people think that it’s important. Feb. 9 of last year  is the first time I ever wrote something and published it – which was for NASA. [I wrote] a piece on “Hidden Figures” (2017)… nominated for the Oscars. It is crazy to think that not only what I am doing is important to other people and I have this voice, but [that] they want to hear it. It is really humbling. Q: With these new opportunities, are there any new challenges or instances of backlash that you have faced? A: Initially there was a lot of negativity that came out of it. Even now, there are the occasional tweets from people that are making fun of me or saying something about my gender or race. I think after the initial bad ones, going forward, it was something I expected. Other than that, I don’t think there are any true challenges. There are also a lot of people that want me to post videos for their site, or record things and speak to their students. [But] there have to be occasions where you say no. That is something that… can be hard. I always want to be helping, doing more, and advocated for girls. But when you see someone with an unprofessional site, or doing everything from Facebook, that is not something I want to put my name on. Q: How has this at all shaped future plans, or where you will be going? A: Going to the White House and writing for Vanguard Stem has changed the way that my resume looks. I still want to be a research scientist, but the new things that I have been exposed to have opened the doors for me to be involved in science policy and science communication. These are things that I have always had an interest in, but never had a way to pursue it and now I do. These are things that are going remain important to me throughout the rest of the things I do in science. Q: What advice would you give young BPS majors that are eager for a career in the science or medical field? A: Outside of going viral and all of that, I have had a lot of different experiences in research and worked really hard to get to the place that I am. In all of that, I would say that the most important thing is networking – being able to communicate and present yourself well. Career Services has things that talk about how you look and how you interview; but outside of all those formal aspects, a lot of people look at social media and think it should all be… private. People don’t want employers looking at their social media; sure you do. It is all about how you present yourself. If you’re consistent with that, it paints a strong picture of who you are. Even at my interview yesterday, one guy said he googled me. That can be an asset. [Start] networking in person, in conversation with people, go to conferences, and talk to professors at a school you want to go to, maintaining those good communication skills. If you want to go into research, they will ask you about writing because you will be writing grants. If you want to go to medical school, you will be communicating with people.